Note: on March 12, 2019 Disney World raised ticket prices for the rest of 2019. On average, prices for longer tickets went up about 8%, but that average masks much different changes some times of the year–for example, after Christmas. Prices on this page are fully updated, and an analysis of the changes is here. My partner Official Ticket Center will sell old-priced tickets through March 24th. On October 16, 2018, Disney World moved to a new date-based ticket pricing approach. (The former “Magic Your Way” tickets purchased before then are still usable based on the terms with which they were sold.) On March 12th, 2019, DIsney World changed–mostly raised–ticket prices for the rest of 2019. 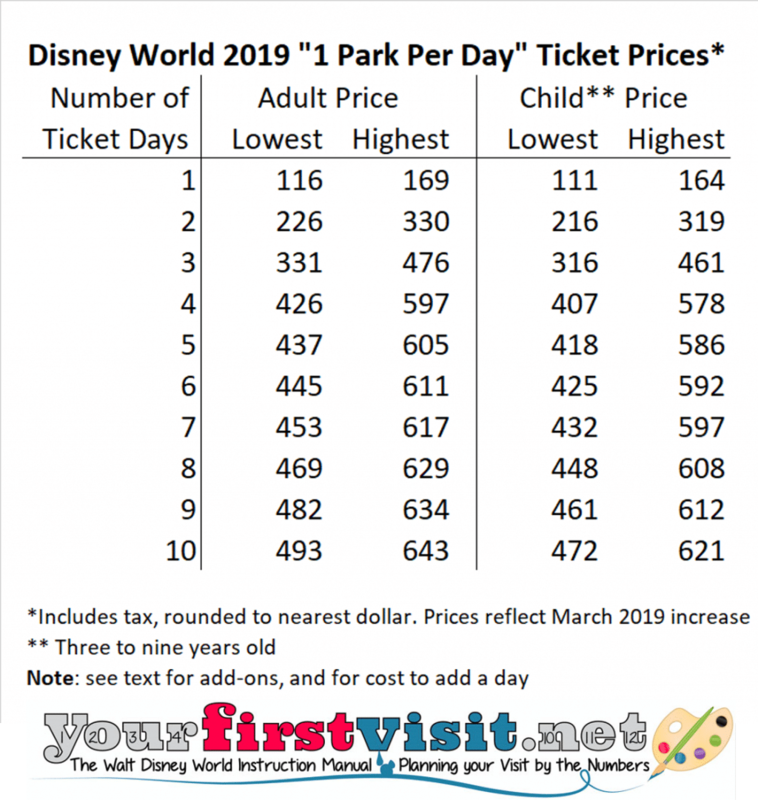 New Disney World theme park ticket prices vary based on how many park days they are purchased for, as they always have; prices now also vary depending on the first day of use they are eligible for. Moreover, both prices and eligible use dates can vary depending on which ticket type you buy, and even how you buy them. There are two bits of good news here. First, you can always add features to a not-yet-expired version of one of these tickets, so if you start with a six day base theme park ticket, and then decide halfway through your vacation that you really needed an eight day Park Hopper ticket, Disney World will allow you to pay the price difference to upgrade your base theme park ticket. So the risk of buying too little ticket is low. Second, you have me to guide you through the process! To actually purchase a ticket, you have to know answers to all four of the questions above. But, because almost everything can be seen as a variant of the base “1 Park Per Day” theme park tickets, I’ll start with that, and then build on it. 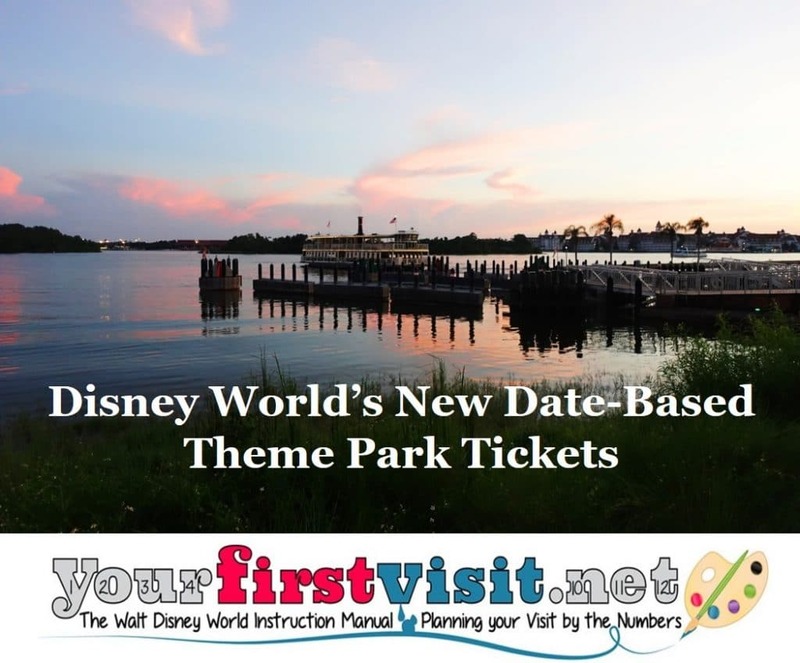 WHAT IS A “1 Park Per Day” DISNEY WORLD THEME PARK TICKET? What Disney calls “1 Park Per Day” tickets—which to save a tree I will call “base tickets”—are tickets good for one park per day for between one and ten ticket days. 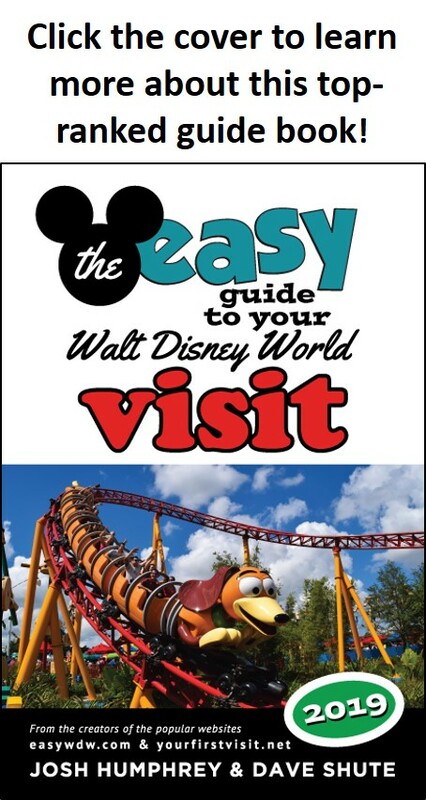 On any base ticket day, you gain unlimited entrances and exits to one single theme park during its regular operating hours. So on one day you can go to Magic Kingdom, leave and return, and on a different day you can go to Epcot, leave, and return again. You can go to any one park on any eligible day. What you can’t do with base tickets is go to two different parks in the same day—for that you need the Park Hopper add-on, discussed below. For any given ticket length and eligibility period, base tickets are the least expensive tickets available to the general public. WHAT OTHER DISNEY WORLD TICKET TYPES ARE AVAILABLE? In addition to base tickets, you can also buy two types of add-ons to base tickets, and a third modifier to base tickets that takes out some of their restrictions. The “Park Hopper” add-on gives you the ability to visit more than one park in a day. Returning visitors commonly enjoy the extra flexibility that Hoppers give them, but I counsel first-timers to only add them after they are sure they need them. Each Disney park takes more than a day to see, and travel between parks can take longer than first-timers might imagine. The “Park Hopper Plus” option is an add-on to a Hopper ticket—you cannot add it to a base ticket. It allows, in addition to the number of theme park days you’ve selected, and hopping among them, a specific number of visits to Disney World’s “minor” venues, such as its water parks, mini-golf offerings, and nine-hole golf at Oak Trails. This add-on costs a flat fee of $26.33 per ticket, and allows you a number of visits to the minor venues equal to the number of days in your base ticket, except for one day tickets, where you get two. Returning visitors planning multiple visits to the minor venues—especially the water parks—can gain real value out of this add on, especially if they had already planned to buy a hopper. First timers generally will gain more value by focusing any extra time they have either on rest or on the theme parks, rather than on the minor parks. The “Flexible Date” ticket is a variant of all the options above. Selecting it frees you from the narrow usage windows and expiration dates that the other options have—which we will discuss more below. These tickets expire December 31 of the calendar year after they are purchased, and can have their first use for any date in that window. Because they can have their first use during any date in that window, including the highest-priced dates, they are priced a little higher than what would otherwise be the highest not-flexible price of the year. The main other option available to everyone is Annual Passes, of which there are various types, which provide unlimited entry to the parks over most or all of 12 months. Narrower populations—most significantly Florida residents, visitors from the UK, and members of the US Armed Forces—can often find different or special offers. Check the Disney World website for eligibility, prices and terms of these. HOW SHOULD THESE DISNEY WORLD TICKETS BE BOUGHT? Base tickets and their add-ons can be purchased separately, or as part of a Disney World package that also includes a Disney World hotel room. If purchased separately, they can be purchased on-line or at the gate. Tickets of three days or longer purchased separately will be $21.30 more expensive if purchased at the gate rather than online. Base, Hopper, and Hopper Plus tickets purchased as part of a package will be the same price as tickets purchased separately online, but have either the same or a better usage window than tickets purchased separately. So if you are also planning to book a Disney-owned hotel room, in many cases it will be best to purchase your tickets as part of a package; if you are purchasing three day or longer tickets separately, buy them online. WHAT ARE THE ELIGIBLE USE PERIODS OF THESE DISNEY WORLD TICKETS? Base, Hopper, and Hopper Plus tickets must have their first day of eligible use identified before you can purchase them. Except for one day tickets, which must be used that exact day, these tickets come with varying usage windows—that is, for example, you don’t have to use a four day ticket on four precisely consecutive days. This lets you fit in days off, visits to other Orlando attractions, water park visits, etc., and lets you roll a bit with family or weather issues. Base and Hopper tickets not purchased as part of a package have the following usage allotments: two and three day tickets get two extra days for use; four through seven day tickets get three extra days; eight through ten day tickets get four extra days. So if you buy a three day ticket whose first day of eligible use is May 3, 2019, you can use this ticket any four days of the seven day period that begins May 3 and ends May 7. Park Hopper Plus tickets get one additional day of use—making it easier to fit the water parks or mini golf into your visit. So the three day ticket in the above example would be usable through May 8. Base, Hopper, and Hopper Plus tickets purchased as part of a package get a usage period of whatever is longer—the usage periods noted above, or the length of the hotel reservation they are booked with, figured as the number of booked nights plus one. So if you bought the same three day May 3 ticket noted above as part of a seven night Disney hotel package, your usage period would be eight days (seven nights plus one), extending through May 10. Flexible Date tickets have a usage period of 14 days—so you can begin the use of this ticket anytime during its eligible period (for tickets bought in 2019, that means through December 31, 2020) and use whatever additional days you bought anytime the thirteen days after. SO if you buy one of these, and first use it May 3, you must complete your park visits by May 16. WHAT ARE THE PRICES OF THESE DISNEY WORLD TICKETS AND HOW DO THEY VARY? If you buy Base, Hopper, and Hopper Plus tickets, the price of the tickets will vary based on the length of the ticket, whether it is for someone ten or older or three to ten years old at the time of their visit (kids younger than three are free), and, new as of October 2018, when the first day of eligible use is. Prices per day always go down with longer tickets compared to shorter tickets with the same first eligible day. While the new date-based pricing means how much they go down will vary over the year, typically the least expensive days to add are days five through ten, each of which costs on average over 2019 just $$9-$17 per day to add. The first ticket day, and days two through four, cost an arm and a leg. Tickets for kids three to nine cost ~$5 to ~$20 less per ticket than tickets for those ten and older, with the larger saving applying to longer tickets. More profoundly, the ticket price also varies depending on the first start date. In the longer ticket lengths—five days and longer—in 2019 prices for tickets of the same length vary over the course of the year on average about $140—that’s a $600 difference for a family of four. See the table for the price range by length for base tickets. Basically, tickets are more expensive during the times when it is most convenient for families with school-age kids to go, so they will be typically higher during holiday periods, common vacation periods, and over weekends. The most expensive tickets are during the popular vacation periods before and after Easter and near the Christmas holidays. For longer tickets, the least expensive tickets are during the common semester-beginning periods of August through most of September; there’s also a period in the first half of May that sees lower prices. To see exact prices for your potential dates go to Disney’s website here (or navigate their from your My Disney Experience account—at the upper left, click “Parks & Tickets,” and from the drop-down menu, go down to “Admissions” and under it select “Theme Park Tickets”), and select your ticket type. From there a monthly calendar will open. After you first select the number of ticket days desired, the calendar will show you the average daily ticket prices by first day of eligible use for every day for which ticket prices have been released. These prices are rounded, and pre-tax, but will illuminate for you the various prices for various possible start dates. If you have many potential dates you could visit, then the chart below might be helpful for honing in on the lowest ticket prices during the periods available to you. 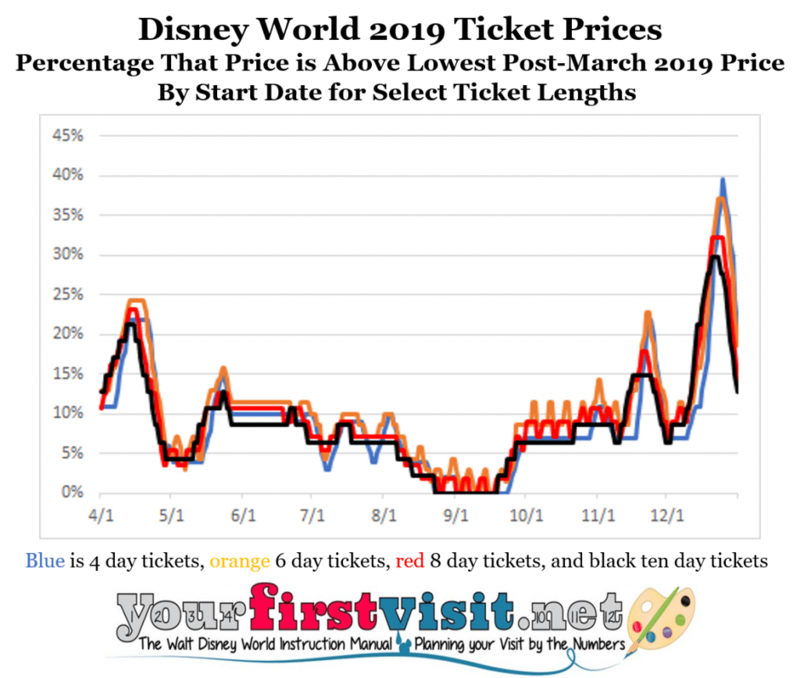 It shows the rounded average price per day for every start day from April 1 through December 31, 2019 of four different ticket lengths—four (blue), six (orange), eight (red), and ten days (black). (I selected this subset because if I included all ten possible ticket lengths, it would be a mess, and I do care about you). 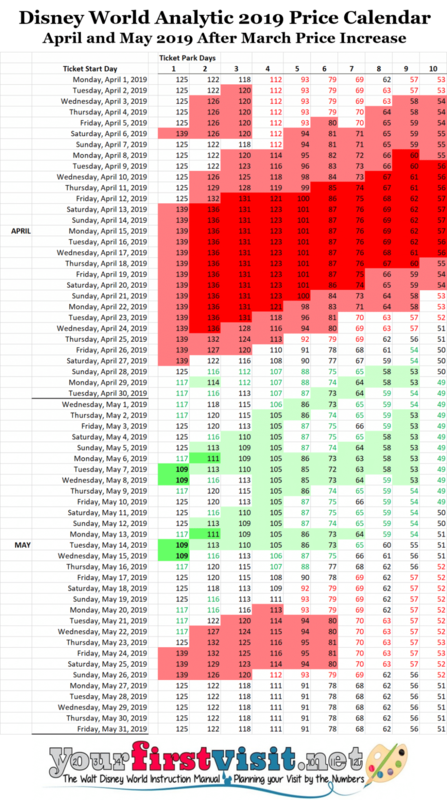 I’ve also posted an analytic calendar for base ticket prices. The way it basically works is that the more and the darker green you see, the better; the more and the darker red you see, the worse, and if there’s no color, you are seeing typical or average prices. The full analytic calendar is here. WHAT FIRST ELIGIBLE DAY SHOULD BE TARGETED FOR THESE DISNEY WORLD TICKETS? Because usage periods for all ticket lengths greater than one day are longer than the number of ticket days, and because average daily prices can be different from day to day, some may find ticket savings by picking as their first eligible day a date somewhat earlier than the first day they plan to be in a theme park. Some of the most extreme examples of this are near Christmas. If you are committed to the parks the five days beginning 12/20/19, a 5 day ticket that begins 12/20 will cost you $525.44. But a five day ticket whose first day of eligible use is 12/17 can also be used for the five days beginning 12/20, and will cost $579.16. That’s a savings of $46.28 per ticket–or $185 for a family of four. Note that this won’t work if you are buying a package—if you have a package, your first day of eligible use will be set as the day you check in to your hotel. WHAT’S THE PRICE TO ADD A DAY TO DISNEY WORLD TICKETS? Back in the olden days—that is, before October 16, 2018—it was pretty straightforward to figure out the extra cost of a ticket a day longer. Adding a sixth through a tenth day cost a flat $10.65 per ticket per day. Now that prices vary so much over the course of the year, you can only know for sure the costs of adding days by comparing tickets of varying lengths with the same start days. On average, the cost to add days five through ten is around $9 to $17, but for any specific date, it can vary from a dollar or two more than $30 per day. WHAT’S NEXT WITH DISNEY WORLD TICKET PRICING? When Disney World first announced that it would be moving to date-based pricing, there was some concern that, since resort hotel prices change over 2019 as much as 65%, that ticket prices might see a very large increase in effective prices for the most popular dates of 2019. At first, this did not happen. At the first release of 2019 prices, no date at any ticket length in 2019 was more than 20% higher than the lowest cost version of that length during the year. The new prices released in March 2019 show much greater differences in highest and lowest pricing, with the most expensive tickets of the year now as much as 45% higher than the lowest prices. There’s’ now a particularly strong incentive to avoid the later December period, which is where all of the very highest prices are to be found. I personally can’t wait for the entire chart to be finished!! Millions of extra people in a Park would be a small price to pay for the opportunity to meet you and Josh.